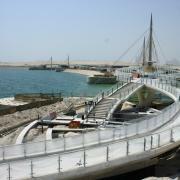 In 2005 Qatar has started a new city development project. Located on the coast and in the northern part of Doha, will soon to become a new city with waterways and man-made islands and modern structures. 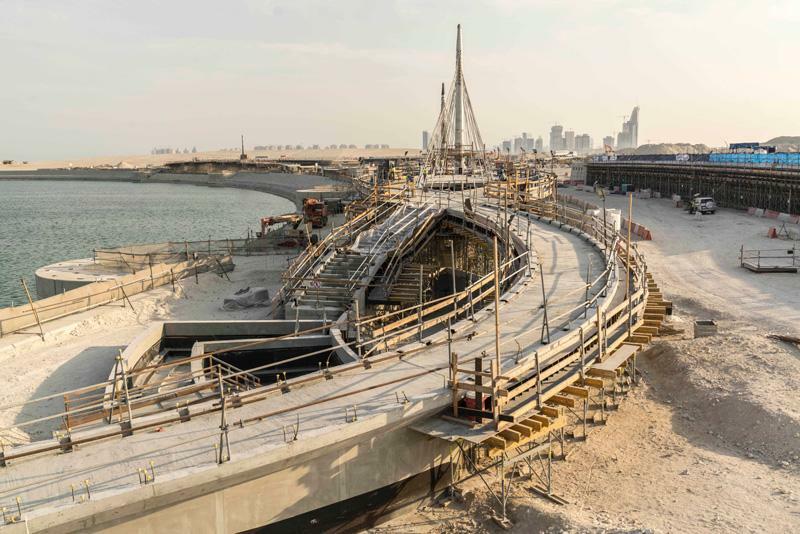 Formwork engineering experts are needed to connect the islands: Doka was hired to supply pre-assembled formwork materials for two pedestrian bridges spanning 90 and 100 m channels separating the islands. Doing so will save the builder time and money. Lusail, the new city in Katar, will include large blocks of land and bodies of water, internal connecting channels and offshore islands. Two Pedestrian bridges that connect three islands will provide a continuous pedestrian experience fringing a marina for 350 boats. For forming these bridges, builder FCC Construction-Petroserv JV relies on decades of expertise gathered by Doka engineers. Ellipsis design in fair-faced concrete. 100 m long and built simultaneously. This means the quantity of the required formwork material must be double. The formwork system for bridge construction consists of the Load-bearing tower Staxo 40 and Large-area formwork Top 50 which meets all architectural requirements specified by the customer. This includes the surface structure of the bridge deck that was to meet requirements of fair-faced concrete provided by Dokaplex formwork sheet. Precision panel joints result in a perfect joint pattern that eliminates rework. Due to the course of the changing bridge level, the shoring tower has to be adapted accordingly for each pouring section. The flexible Load-bearing tower Staxo 40 allows for precise adaptation of the shoring tower to the building specification. Adjustable U-heads and feet of the screw jacks with 75 cm extension range allow for easy height adjustment. In order to provide for maximum efficiency in terms of construction time, the bridge deck formwork was assembled in advance. Pre-fabrication at Doka's pre-assembly service saves time and space on site and at the same time reduces costs. The finished systems were delivered just in time by way of special shipment and immediately ready for use. 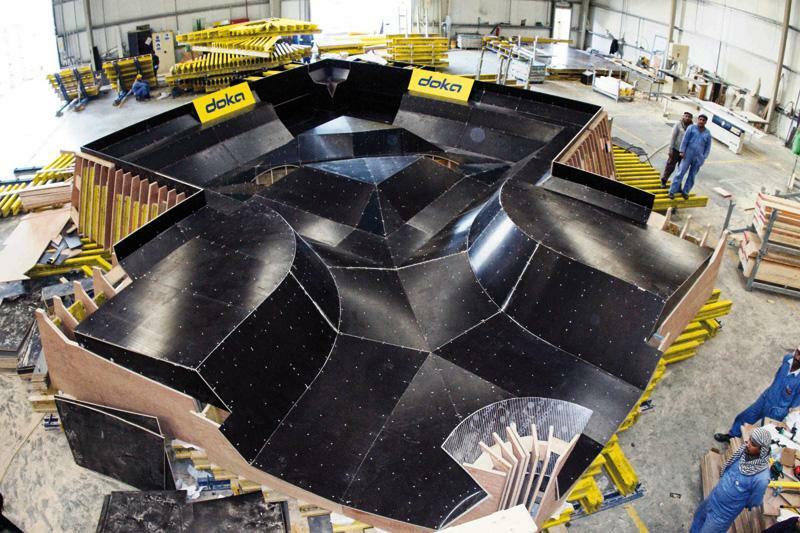 "We are very happy with the pre-assembly of formwork systems. It saves us time and ensures quality. This process made assembling the formwork sheets on the load-bearing tower quick and easy", said Victor Gomez Lopez, the FCC Construcción Construction Manager. Since Doka engineers were already involved during the planning stage, they were able to provide valuable advice on all issues regarding options for formwork engineering pertaining to architectural requirements. 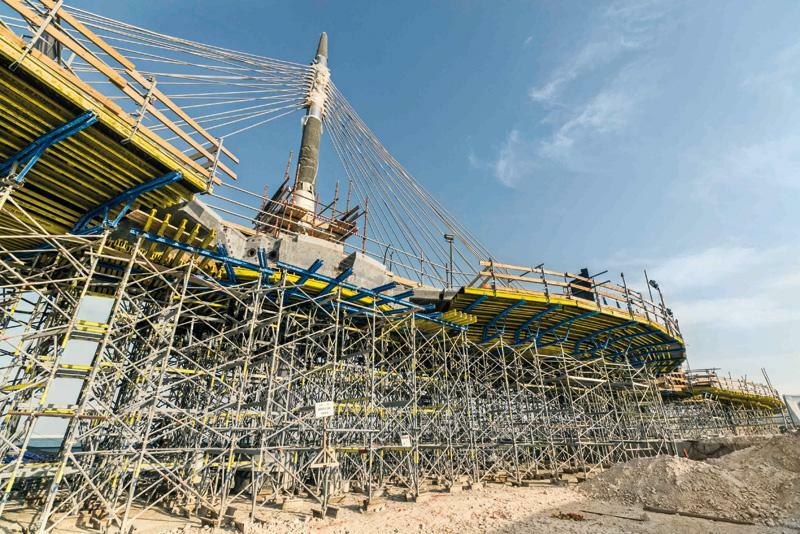 Here, the ability to adapt quickly was also necessary, with the bridge design and consequently load-bearing tower and formwork requirements changing several times during planning. Theoretical and hands-on training session prior to start of construction were helpful for the crew. It ensured smooth implementation of processes and efficient construction progress. 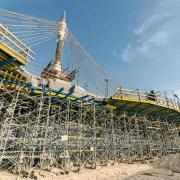 "Proximity to the Doka branch in Qatar allowed for quick feedback in case of questions. Thanks to the on-site formwork instructor, technical support was available any time", Lopez commented further. Lusail is an urbanisation project along the east coast north of Doha, the capital of Qatar. The planned city will be built on a 38 km² area starting at the West Bay Complex Canal north-east of Doha. It stretches 7.5 kilometres north along the coast and extends up to five kilometres inland. After completion, this pocket of land will be home to a population of 200,000, offer work for 170,000 people and accommodate 80,000 visitors. To this end, comprehensive earth movements have taken place starting in 2007. The initial formwork was delivered in August 2013. 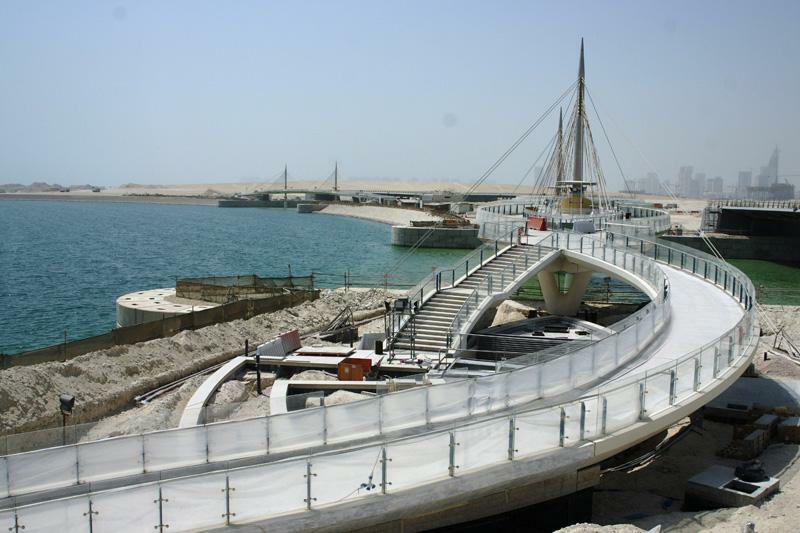 In-situ concrete work for both pedestrian bridges was completed on-schedule by early 2015. Thank you for your interest - Linking the Islands. 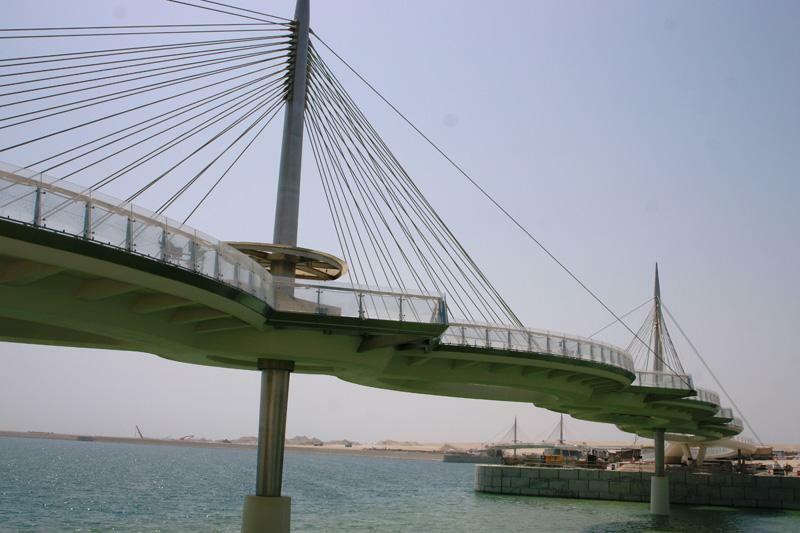 Lusail pedestrian bridges, Qatar. Thank you very much for your interest - Linking the Islands. 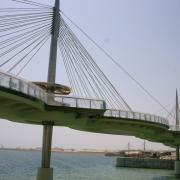 Lusail pedestrian bridges, Qatar.